The CEO's ambitions are to blame for its lopsided balance sheet, some say. Could it be that Under Armour, Inc. (UAA - Get Report) aimed too high? 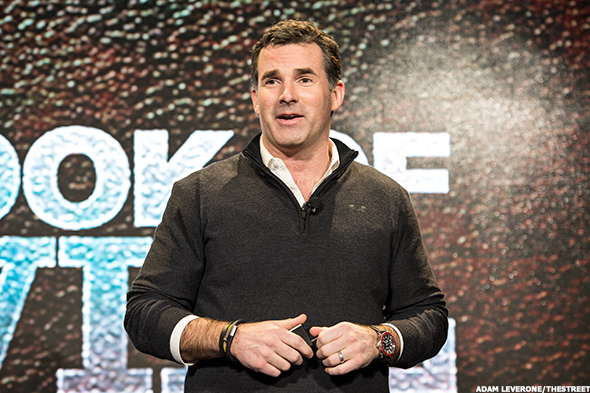 After yet another disappointing quarter in earnings, investors are getting anxious about Under Armour's direction under CEO Kevin Plank, analysts said. "Shareholders are upset with Plank. At this point, he's got no credibility," said Laurent Vasilescu of Macquarie Research in an interview with TheStreet. Plank has overestimated guidance all year, Vasilescu added. "He thinks revenue will be slightly up in Q4, but that won't happen," he said. "Revenue will be down next year too." Plank, to an extent, came slightly short of admitting that his plans of aggressive expansion have backfired for the company. The sportswear retailer's troubling disposition, he said in the earnings call Tuesday, Oct. 31, is partially "the growing pains that came as a result of such rapid expansion." But growing pains may be an understatement. "Kevin Plank eroded the balance sheet with endorsements, building headquarters, massive distribution centers and the acquisition of the fitness apps," Vasilescu said. "The issue is that he built this entire SG&A base in order to create capacity to support a $5 billion to $8 billion business." That base, he said, can't account for a company with negatives on its balance sheet— even with its planned restructuring, which will cost Under Armour up to $150 million in fiscal 2017, according to CFO David Bergman. But it's unclear if the company would have enough cash flow to pull it off, Vesilescu added. Under Armour has more than $1 billion in total debt as of Sept. 30, and cash and equivalents of $258 million. In its earnings report Tuesday, it posted earnings of 22 cents a share and a revenue of $1.4 billion—down 5% from the same time a year earlier. Its gross margin declined to 46.2%. Others are softer on the 45-year-old Plank, who founded the company in the 1990s in his grandmother's Washington, D.C. row house. "I think there are a lot of people pointing fingers, debating about stock," said Andrew Burns of D.A. Davidson. "But the current problems are a culmination of things, including [Plank's] growth ambitions, at the same time as product weakness...and the wholesale channel problem the entire industry is facing." Its growth plan, now responsible for the toppling SG&A base, was set in place "when they were growing north of 20%," Burns added. And then the market changed. But even if shareholders were upset with Plank, ousting him isn't an option. Under Armour has a dual-share model, but there is a third class of shares that aren't publicly traded, are not worth anything to investors but hold a disproportionate number of votes per share. Plank, of course, holds tens of millions of shares in this class, essentially controlling the entire voting structure of the company. "Sure, people would love to see him out," Vasilescu said. "But that's not in the foreseeable future." Under Armour shares are down 3% Wednesday morning, Nov. 1, at $12.